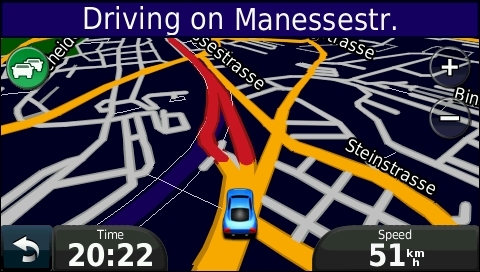 GPS receiver with fast auto-routing, voice guidance including announcement of street names, lane assistant, ecoRoute, traffic news, Google local search and other online services, color display with touchscreen, worldwide base map, pre-loaded detailed maps of all of Europe plus Blue Tooth and USB interface. Well suited as navigation system in vehicles but may also be used as hand held device. 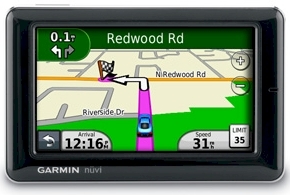 The model GARMIN Nüvi 1690 provides fast automatic route calculation - including multiple intermediate destinations if required - plus visual and voice guidance. 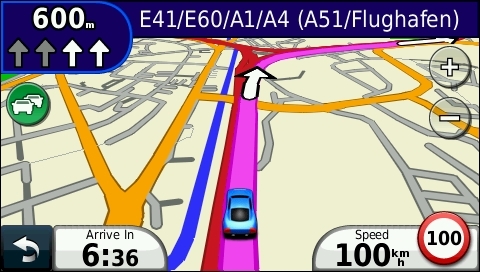 The lane assistant indicates the correct path in great detail if there are multiple lanes. The integrated GSM module provides access to traffic news, Google local search, currency exchange rates and other online services. 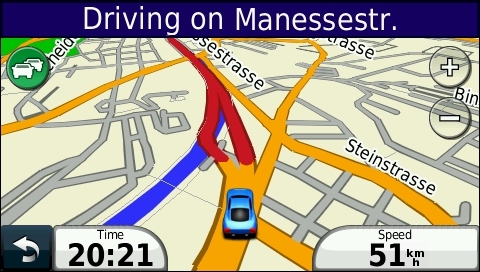 The traffic news can be used to compute detours around traffic jams, closed roads etc. 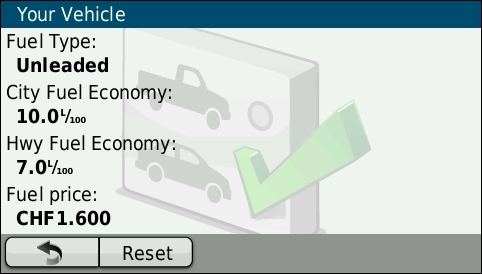 The ecoRoute feature helps to improve your driving economy and to reduce the carbon footprint of your car. The Nüvi 1690 is easy to use, has a large, easy to read color display with touch screen, an extremely sensitive antenna and an integrated worldwide base map. 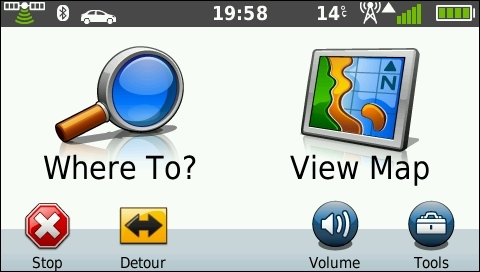 It is very well suited as a navigation system in cars, but you may also use it as a hand held device. It has 3.62 GB built-in memory to store detailed maps with even more information, such as local roads, hotels, restaurants, public buildings and points of interest. This model comes with pre-loaded maps of all of Europe which occupy approximately 2.63 GB of memory including various language files. The remaining 0.98 GB memory is available to store additional detailed maps, waypoint files or pictures. 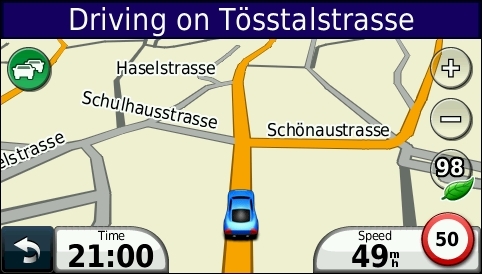 It also has a speech computer to announce the names of the streets. 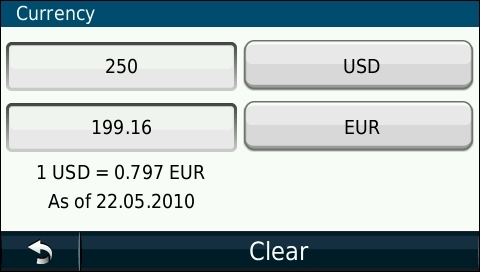 The Nüvi 1690 is equipped with a BlueTooth interface to communicate with mobile phones which have the required communication capabilities in order to call car rental offices, hotels, restaurants etc. 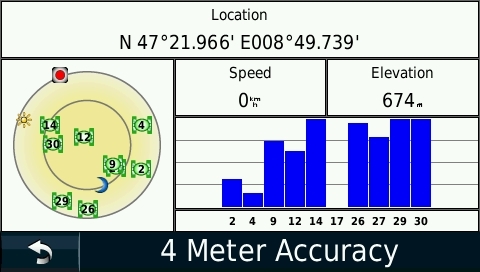 whose phone numbers are stored on the GPS with a single touch on the screen. It can also act as a hands-free extension set to the phones. 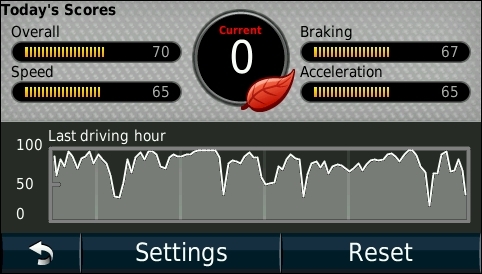 In addition, the GPS has a slot for an optional microSD memory module to store additional maps or data and an USB connector to exchange data with a computer. The device is powered by a rechargeable battery. 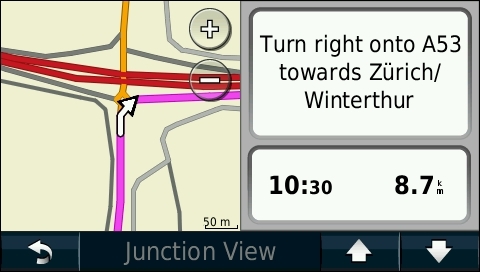 The Nüvi 1690 provides navigation information outdoors, in a car, in a train or even in an airplane (see MapSource examples). 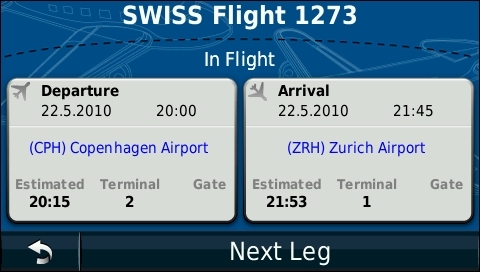 User interface in 19 languages: Afrikaans (South Africa), American English, British English, Czech, Danish, Dutch, Finnish, French, German, Italian, Norwegian, Polish, Russian, Spanish, Swedish and four asian languages. 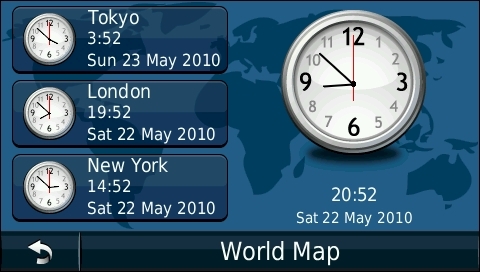 Voice prompting in 39 languages: Afrikaans, American English, Arabic, Brazilian Portuguese, British English, Bulgarian, Canadian French, Cantonese, Catalan, Croatian, Czech, Danish, Dutch, Estonian, European French, European Portuguese, Finnish, Flemish, German, Greek, Hungarian, Italian, Japanese, Korean, Lithuanian, Luxembourgish, Mandarin (China), Mandarin (Taiwan), Norwegian, Polish, Romanian, Russian, Serbian, Slovak, Slovenian, Spanish, Swedish, Taiwanese and Turkish. 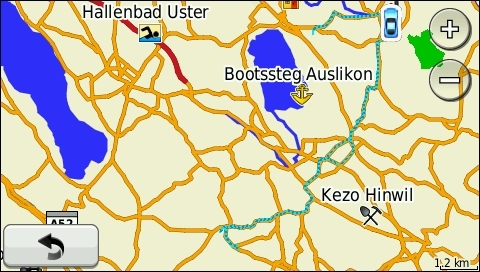 3.62 GB built-in memory to store detailed maps with even more information, such as local roads, hotels, restaurants, public buildings and points of interest. This model comes with pre-loaded maps of all of Europe which occupy approximately 2.63 GB of memory including various language files. The remaining 0.98 GB memory is available to store additional detailed maps, waypoint files and pictures. 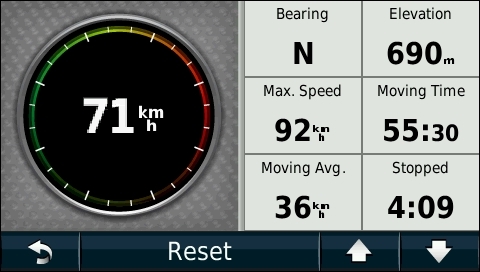 Routing speed: 8.07 (see GPS Routing Speed for details). Online services such as Google Local Search and traffic news. 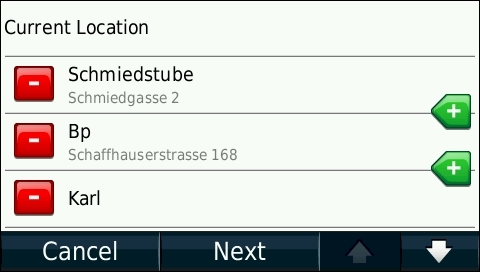 Receives and processes traffic news messages. 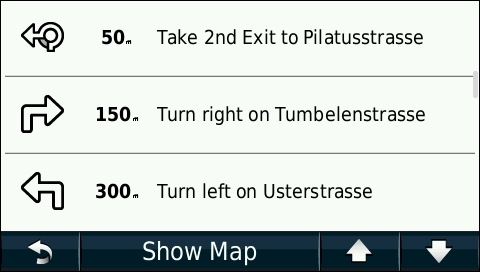 If the GPS receives a message about a traffic jam, blocked road etc. 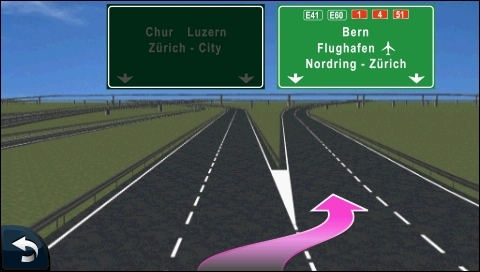 along the planned route, it can automatically compute a detour. 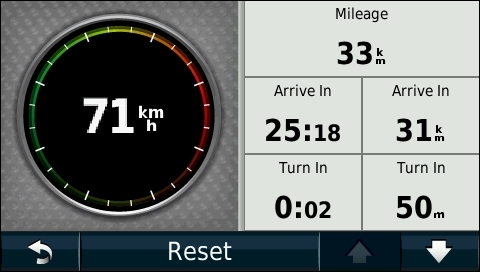 The purchase of the GPS includes a free two year subscription to the online services. Slot for micro SecureDigital memory card (µSD memory cards available as options). Powered by built-in rechargeable battery (lasts up to 3 h) or by an external 12/24 V power source, e.g. from a car's cigarette lighter (power cord included). 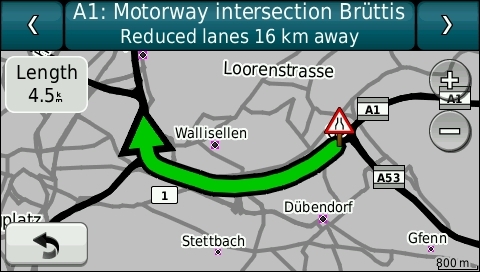 (Receives traffic messages via the integrated GSM module). 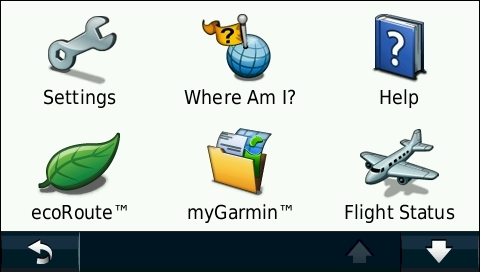 Finds routes 8 times faster than the GARMIN StreetPilot III, see GPS Routing Speed for more information. 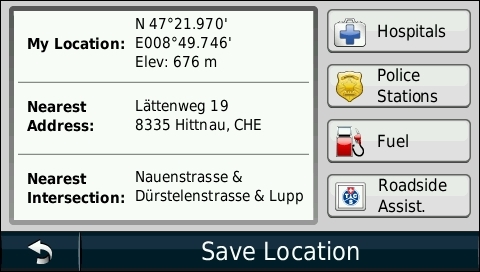 Stores up to 1000 waypoints with name (up to 30 characters), icon (choice of more than 80 symbols), image and phone number. Supports categories to organize waypoints. The images below show the display of the Nüvi 1690 in true resolution (480x272 pixels). This does not necessarily mean the display is shown it its true size (97x57 mm), the actual size of these images depend on the properties of your display. Many of the pages are configurable, the pictures are just examples. 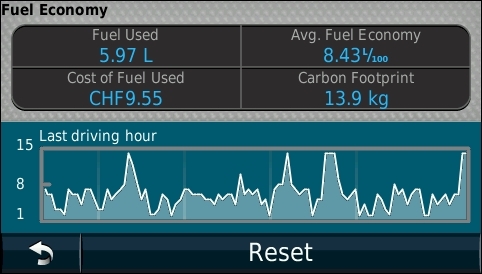 Status bar with GPS signal strength, Blue Tooth status, routing mode (car, bike, pedestrian), current time, weather, GSM signal strength, battery charge level. 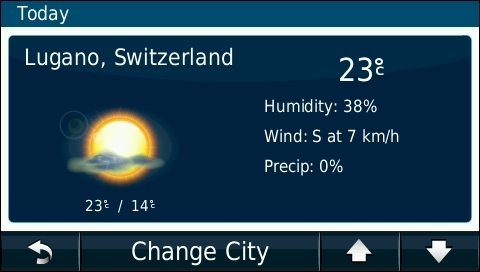 Touch an icon to switch to the corresponding page (keep your finger on the satellite icon for a few seconds). 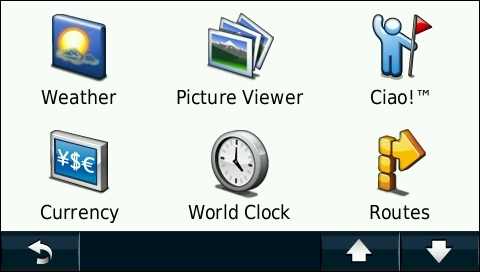 Picture viewer, displays pictures and provides various options, such as zooming, slide show etc. 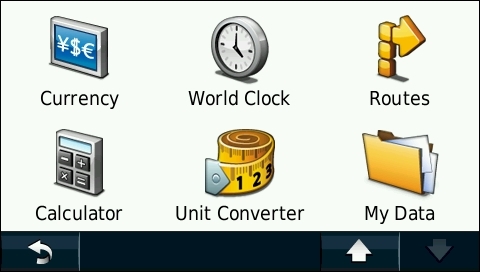 Unit converter to convert distances, areas, volumes, speed, weight and temperatures in metric and American units. This model has been discontinued; however, you can still order options for the Nüvi 1690T. 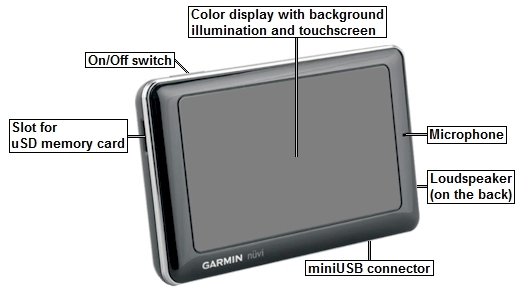 All options for the GARMIN Nüvi 1690 in detail, find maps here.